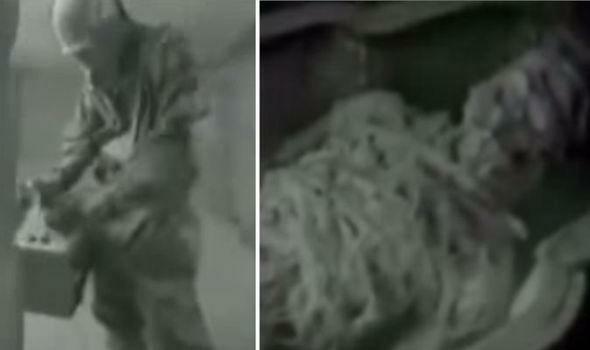 Reports from the Sci-Fi Channel indicate that forensic experts who analyzed the footage have CONFIRMED it is genuine. 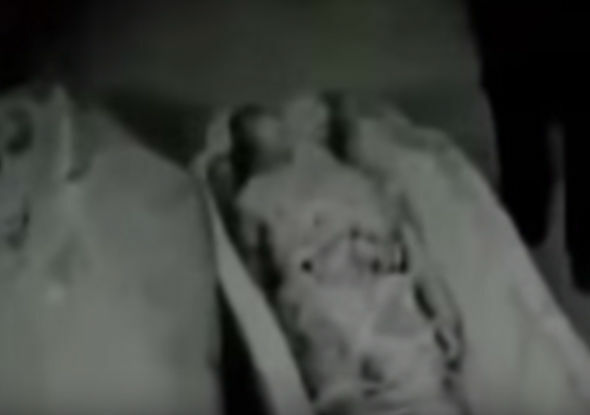 The video illustrates what appears to be Soviet military personnel opening an ancient Egyptian sarcophagus said to have been located somewhere in the Giza plateau. Inside the alleged Sarcophagus were the remains of a so-called Ancient Alien and pieces of otherworldly technology. According to numerous reports, the video presented here was filmed during a top-secret mission called ISIS which supposedly recovered the remains of a so-called ‘Ancient Astronaut’. Officially, humanity is STILL waiting for proof of alien life elsewhere in the universe. While many people claim there is evidence all around us, millions of people remain skeptical when it comes to alien lifeforms and alien technology. Whether or not advanced alien civilizations exist elsewhere in the cosmos, and whether or not these advanced alien civilizations have visited Earth in the distant past remains hot topic that has been debated continuously for the past 20 years at least. This alleged video –which we know little about— if proven to be real would make the alleged Roswell UFO crash in New Mexico a small story. Today millions of people around the world are firmly convinced ancient civilizations have been visited by beings not from Earth for thousands of years. These ‘visitors’ were misunderstood by primitive man as Gods when in reality they were nothing more than advanced beings with superior technology. The video presented in this article –which many claim is ANOTHER hoax— details a top-secret mission called Project ISIS where a number of Egyptologists, members of the Soviet Academy of Science, researchers and military personnel recover thousand-year-old Alien technology from Egypt. Claims on the internet suggest the footage was obtained by an ‘unnamed’ source which in turn claims to have obtained the clip from the secret archives of the KGB. The video illustrates what appears to be Soviet military personnel opening an ancient Egyptian sarcophagus said to have been located somewhere in the Giza plateau. Inside the alleged Sarcophagus were the remains of a so-called Ancient Alien and pieces of otherworldly technology. According to reports, the alleged being was over two meters in height and radiocarbon dating revealed it was around 13,000 years old. The video further shows Soviet soldiers entering the so-called tomb without protective gear but retreat upon opening the sarcophagus as fumes erupt fro within it. Soldiers return to the sarcophagus moments later with protective gear. People who remain skeptical despite seeing the video suggests it’s nearly impossible to conclude whether or not the video is authentic, what the mummy was and where it was filmed. However, the Sci-Fi TV Channel indicates that forensic experts who have analyzed the footage have CONFIRMED that it is genuine. A tv documentary suggests that several testimonies from a number of highly ranked KGB officials corroborate the story and point to the fact that the mummy recovered by the military was not from Earth. Further reports indicate that a Viktor Ivanovich –an alleged Soviet scientist—had access to classified files from the KGB archives. Ew cannot say for certain whether or not the footage, the so-called secret mission, and the discoveries are real. However, there are ancient Egyptian texts –also considered as bogus by many sketpics— which indicate what many believe are otherworldly visitations that occur in Ancient Egypt thousands of years ago. What do you think about the video and its suggestions? Let us know what you think and as always YOU decide.